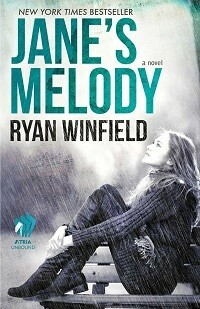 I purchased Jane's Melody, a New York Times' Bestseller written by Ryan Winfield and read the title about three months later - long enough to have forgotten the synopsis. Instead of going online and refreshing my mind, I allowed myself to begin reading, to see where the story would take me. Jane's Melody begins with the following words, "The day after the funeral, Jane came back to the island cemetery and sat in her car, watching the rain fall on her daughter's grave." Already, I was concerned about Jane and wondered what had happened to her daughter. I wondered about their ages, whether Jane was a young mother having just buried an infant or whether she was middle-aged or a senior. Ultimately, their ages didn't matter; a mother buried her daughter and that was enough to draw me in as I tried to imagine how I would feel if I lost one of mine. As the story progressed, Jane introduced me to a street musician named Caleb. He played the guitar and sung such soulful music that I, myself, wish I could have heard him play and sing. Hoping he could provide information about her estranged - now deceased - daughter, Jane invited him home. Coming up with an offer he couldn't refuse, Caleb soon found himself working on the landscaping at Jane's house, in exchange for room and board plus a modest salary. The foundation has been laid and the story begins as this inter-generational couple not only become attracted to each other but, ultimately, fall in love, Jane being 16 years older than Caleb. We see Jane's insecurity as she tries to justify such an age difference between them, not to mention that, had her daughter lived, she and Caleb may have gotten together. Guilt plagues her mind even as desire rushes through her body. Jane's Melody does have its share of sexual content (which I typically frown upon when there is an excess amount) but the story itself is beautiful. In fact, Jane's Melody shares a few stories within its pages and, overall, it's a title I found to be filled with hope, healing and promise for what tomorrow may bring. If you would like to take a look at even two or three of the 2,000+ reviews on Amazon, just click the book cover. I am sure this story by Ryan Winfield is one you would enjoy.